Diary of a pre-war country garage, 1932 - 1933. Homepage. This page: Job book for a rural garage in 1932 and 1933. Diary for a pre-war vintage garage. Recently I was fortunate enough to be lent this fascinating old job book, which was used by the owner of a rural garage back in 1932 and 1933. 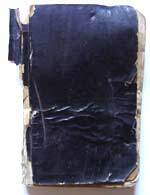 Its condition is very poor, and could so easily have been lost. It relates the cars that were worked on, with notes about the work required, the vehicle's registrations, and also the owner details in some cases. It provides an interesting insight into the life of a garage owner during the pre-war years, working on cars, vans, and other commercial vehicles. Notes about the signwriting of vans also appear. Many garages started out life prior to the mass usage of the motor-car as engineering shops, or bicycle repair shops. As the cost of motorcars and motorcycles came down, enabling those with average salaries to benefit from the freedoms of the road that motoring introduced, the need arose for service and repair facilities in villages up and down the land. Many bicycle sales and service businesses branched into the maintenance of the automobile, often installing a hand-crank fuel pump to supply petrol to these newly mobilised customers. Advert from a contemporary magazine, showing Mazda motor-car bulbs, just the type of spare part that rural garages would have sold to motorists. Servicing of cars in the '20s and '30s was more of a big deal than it is today, with more service items needing regular checking in order to maintain a semblance of reliability. Lubricant and coolant levels were checked religiously, and the grease gun applied to the many steering and suspension joints every few hundred miles. Punctures were much more common back then, with repairs often effected to inner tubes using the vulcanisation process. Cars were designed with maintenance in mind. Components could be dismantled, overhauled and cleaned as required, then be put back together again for further service. Compare that to now, where sub-assemblies are simply thrown away and replaced with new. Some car owners, perhaps ex-military men with an interest in things mechanical, took to maintaining their own cars, but others, to whom internal combustion was a thing of magic, quickly found that the services of a local repair garage were essential. Garages would be found on most main roads, and many villages had at least one automobile repair shop to choose from. Sadly in recent years, many of these old garage sites have been cleared away for housing, and service centres centralised to the main towns and cities, although a few 1920s & 1930s garages still exist (pics). Petrol stations are now more likely to stock a range of pasties, than they are a good selection of oils or fanbelts. Partly this is due to the huge variety of cars now on the roads, partly because fewer people tinker with their own vehicles any more, their excessive complexity rendering home-spannering a thing of the past (unless you own a classic or vintage car of course!!). The contents of this unimpressive looking book therefore reflect a byegone age, when things were a great deal simpler than they are today, and good service something that was the norm rather than the exception. 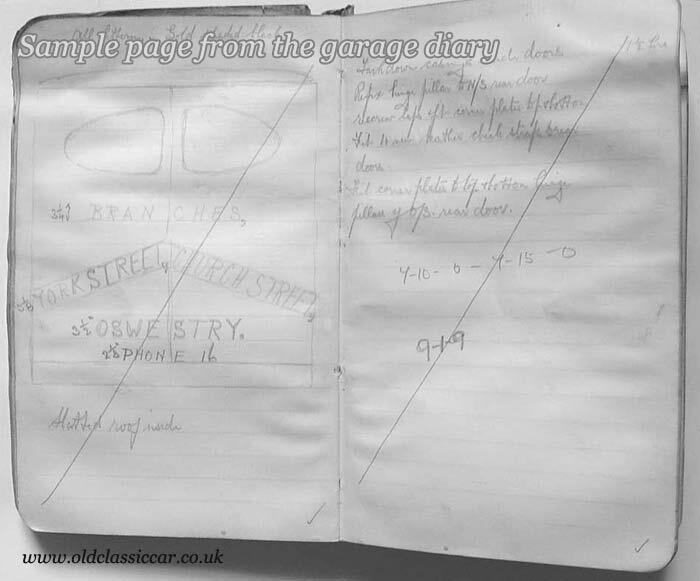 The early pages of this book have suffered with damp over time, and sadly the page that gives the garage owner's details is damaged and no longer legible, so the exact location and name of this garage is lost in the mists of time. Judging by the customer addresses written in the book, the garage was located somewhere in the mid-Shropshire/Welsh borders area. O/S Rear. New celluloid 2ft x 20. Mr Rees, Salop Rd, Oswestry. (N/S Rear Wing) To beating out to shape damaged N/S rear wing, re-setting & re-straightening flange, re-setting & screwing N/S/R wing to body. Wing drilled & new round head screws fitted. Front head lamp support bar drilled & new AA badge fitted. Car washed off & polished inside & out.